Presenting this set of slides with name - Accident Icon Showing Man Struck By Electricity. This is a one stage process. The stages in this process are Accident Icon, Misfortune Icon, Misadventure Icon. Presenting high risk icon with meter and indicator. This is a high risk icon with meter and indicator. This is a one stage process. The stages in this process are high risk, risk management, high danger. "Microsoft PowerPoint Template and Background with a large military aerial bomb over top of a keep out sign"
Presenting this set of slides with name - Red Human Icon With Danger Sign. This is a three stage process. The stages in this process are Conduct, Behaviour, Way Of Acting. 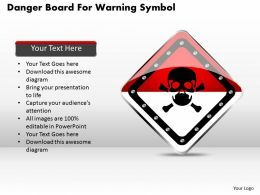 We are proud to present our 1114 danger board for warning symbol powerpoint template. 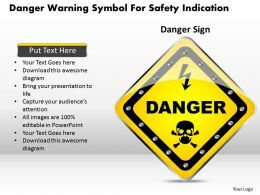 This Power Point image template has been crafted with graphic of danger board. 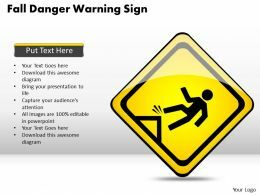 This image template contains the concept of warning generation. Use this image template for your warning related presentations. 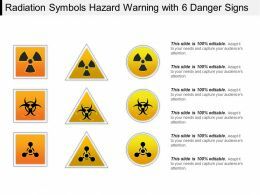 Presenting radiation symbols hazard warning with 6 danger signs ppt slide. This is a radiation symbols hazard warning with 6 danger signs ppt slide. This is a nine stage process. The stages in this process are radiation symbols, hazard symbol, radio waves symbols. "Microsoft PowerPoint Template and Background with an orange sign warns of danger ahead"
Presenting this set of slides with name - Vulnerability Management Icon Slide. This is a one stage process. The stages in this process are Vulnerability Management, Risk Management, Vulnerability Planning. Presenting this set of slides with name - Content Ppt Show Icon. This is a twelve stage process. The stages in this process are Risk Assessment, Risk Analysis, Risk Register, Risk Mitigation Plan, Risk Tracker. "Microsoft PowerPoint Template and Background with risk colorful words hang on rope by wooden peg"
Presenting this set of slides with name - Risk Table Icon Powerpoint Slide. This is a one stage process. The stages in this process are Risk Table, Risk Matrix. Presenting this set of slides with name - Risk Mitigation Plan Ppt Icon. This is a three stage process. The stages in this process are client management, server, technical. Presenting this set of slides with name - Qualitative Risk Analysis Ppt Icon. This is a five stage process. The stages in this process are Probability, Negligible, Minor, Moderate, Significant. Presenting global risk protection icon ppt background designs. This is a global risk protection icon ppt background designs. This is a one stage process. The stages in this process are hazard symbol, risk icon, risk management icon. Presenting risk analysis icon ppt background graphics. This is a risk analysis icon ppt background graphics. This is a one stage process. The stages in this process are hazard symbol, risk icon, risk management icon. Presenting risk mitigation icon ppt example 2017. This is a risk mitigation icon ppt example 2017. This is a one stage process. The stages in this process are hazard symbol, risk icon, risk management icon. Presenting risk operational icon ppt example file. This is a risk operational icon ppt example file. This is a one stage process. The stages in this process are hazard symbol, risk icon, risk management icon. Presenting this set of slides with name - Accident Icon Showing Collison Of Two Car. This is a two stage process. The stages in this process are Accident Icon, Misfortune Icon, Misadventure Icon. Presenting this set of slides with name - Financial Risk Icon With Dollar Sign. This is a three stage process. The stages in this process are Hazard Symbol, Risk Icon, Risk Management Icon. Presenting this set of slides with name - Compliance Icon Report With Form Tick Mark. This is a one stage process. The stages in this process are Governance Icon, Risk Management Icon, Compliance Icon. Presenting this set of slides with name - Compliance Icon With Hands And Continues Arrows. This is a two stage process. The stages in this process are Governance Icon, Risk Management Icon, Compliance Icon. Presenting this set of slides with name - Compliance Icon With Two Gears And Arrows. This is a two stage process. The stages in this process are Governance Icon, Risk Management Icon, Compliance Icon. Presenting this set of slides with name - Square Compliance Icon With Tick Mark. This is a one stage process. The stages in this process are Governance Icon, Risk Management Icon, Compliance Icon. Presenting this set of slides with name - Biological Hazard Icon Showing Caution Sign. This is a one stage process. The stages in this process are Biological Hazards, Biohazards, Biological Agent, Health Hazard. Presenting dollar clock risk measurement icon with circles. This is a dollar clock risk measurement icon with circles. This is a three stage process. The stages in this process are investment risk, risk management, financial risk. Presenting money risk icon with dollar and explosive. This is a money risk icon with dollar and explosive. This is a one stage process. The stages in this process are money risk, investment risk, finance risk. Presenting this set of slides with name - Risk Management Man With Caution Sign Icon. This is a one stage process. The stages in this process are Governance Icon, Risk Management Icon, Compliance Icon. Presenting this set of slides with name - Risk Management Caution Sign With Gear Icon. This is a one stage process. The stages in this process are Governance Icon, Risk Management Icon, Compliance Icon. Presenting this set of slides with name - Project Risk Icon Ppt Examples Slides. This is a three stage process. The stages in this process are Project Risk, Risk Management, Project Management. Presenting this set of slides with name - Project Risk Icon Powerpoint Slides Ideas. This is a three stage process. The stages in this process are Project Risk, Risk Management, Project Management. Presenting this set of slides with name - Risk Management Plan Ppt Icon Aids. This is a four stage process. The stages in this process are Type Of Risk, Outcome, Rating, Target Date, Person Responsible. No risk of graphic pixilation whatever be the size of screen to display. Use the variety of relevant icons. Attune well with the Google Slides and other offline softwares. 100% customization of the slide icon. Useful for the business presenters, investors, accounts and stock exchange individuals. Presenting summery of risk management ppt icon. This is a summery of risk management ppt icon. This is a five stage process. The stages in this process are control, identify, analyze, plan, track. Presenting high business risk icon with clock dollar and fulcrum. This is a high business risk icon with clock dollar and fulcrum. This is a two stage process. The stages in this process are high risk, risk management, high danger. Presenting high electric risk icon with circle and voltage symbol. This is a high electric risk icon with circle and voltage symbol. This is a four stage process. The stages in this process are high risk, risk management, high danger. Presenting high financial risk icon with dollar and exclamatory mark. This is a high financial risk icon with dollar and exclamatory mark. This is a one stage process. The stages in this process are high risk, risk management, high danger.